Am I the only one that wakes up on a Monday morning with an overwhelming urge to hit the reset button? To try and un-do all that was done over the weekend in an attempt to restore order to my life and body? When I woke up this morning I felt like I needed not only a mental but a physical cleanse. I just wanted to be kinder to my body and to my mind, and to feel better. This weekend I drank a little more alcohol than I should have, ate more sugar than I should have, and was in a bad mood almost the entire time. I am a firm believer that what you put into your body has a direct effect on your mind and your mood. So, it only makes sense that after an over indulgent weekend filled with sugar, complex carbohydrates, and negativity, I woke up this morning feeling and intense need for change. I should add that my bad mood perpetuated this bad behavior, which in turn put me in an even worse mood. So it’s definitely a revolving circle of self abuse. I used to be so diligent about taking care of myself. I would eat well always, make time for exercise, get plenty of sleep, and be sure to set aside time for working on my mental health and personal happiness. Now that I’m a mom, a full time student, and the person in my house who is in charge of making sure that my family is fed and taken care of, I feel like something has to be sacrificed. Don’t get me wrong, I love my life, but all of this extra stuff hasn’t left me any time for myself and this is becoming an issue for me. I am a person who needs to feel balance in all aspects of my life in order to feel well and be well. * Be good to my body! – Get the refined sugars out of my diet and stop relying on them to enhance my mood and help me feel better. I used to love having fruit as a treat or desert, but now I find myself always reaching for a cookie, or chocolate, etc. Sugar is addictive and all this does is leave me feeling like I need more. * Cut back on alcohol! – Get back to just having a glass of wine or two on the weekends, and that’s it. Same thing with sugar, after one glass of wine, I feel like I want or need another. Usually that’s not a good idea. * Start running and lifting again! – This used to be something that was a priority in my life, and pretty much defined me. Fitness was my career. I had a my own spot in the weight room and the gym and everyone knew who I was. But, being sick with my daughter on and off over the past 5 months, and having a very busy schedule with school and being a new mom has really put a halt to my ability to exercise, and in turn has made me very lazy. I used to go out and run a minimum of 5 miles, 4 times a week as well as find time for strength training. Now, I’m lucky if I get out for a walk a few times a week. I miss that part of myself. With that said, I’m living a new life now and don’t have the the time or the energy to go to the gym and work out for an hour and a half each day, so I’m going to adapt my workouts to fit in with my new life! I’m really excited for these new changes that I’m about to implement in my life! This is just in time for summer, and my wedding in July! Eeeeekkk!!! I want to go into all of this feeling healthy, happy, and whole! I also want to stay accountable to myself and all of you, so I’m going to be using my blog as a way to document my healthy eats and exercise like I used to do when I first started writing. I’m really hopeful about this new journey, and I’m happy that you can all take it with me!! To kick things off, when I got home from school The Boy (as I have affectionately called him since we started dating) took over baby duty so I could get a run in! I ran 3.4 miles around the neighborhood in about 35 minutes! I had some pretty steep hills and a few walking breaks on the way back, but overall I feel great and am happy with my run. It’s been almost 2 months since I laced up my shoes and got out there, and I’m still riding the runners high!! When I got home, Amelia was napping so I got cleaned up and started prepping dinner. When she woke up it was time to eat, and we were all starving!! I didn’t take any pics of dinner tonight because I was eager to get the food on the table, but The Boy and I had baked chicken (that he prepared while I was gone! ), mashed sweet potatoes, and kale salad with avocado and carrots. It was delicious!!! Amelia (my 11 month old daughter who still has no teeth!) had little pieces of chicken, avocado, sweet potato, pasta, and watermelon! She seemed to like the dinner just as much as we did…this kid has an appetite! So, I’d have to say that I successfully hit the reset button today, and I’m feeling pretty good about it! I’ll include some pics of my delicious eats and my beautiful runs the next time I give you all an update. 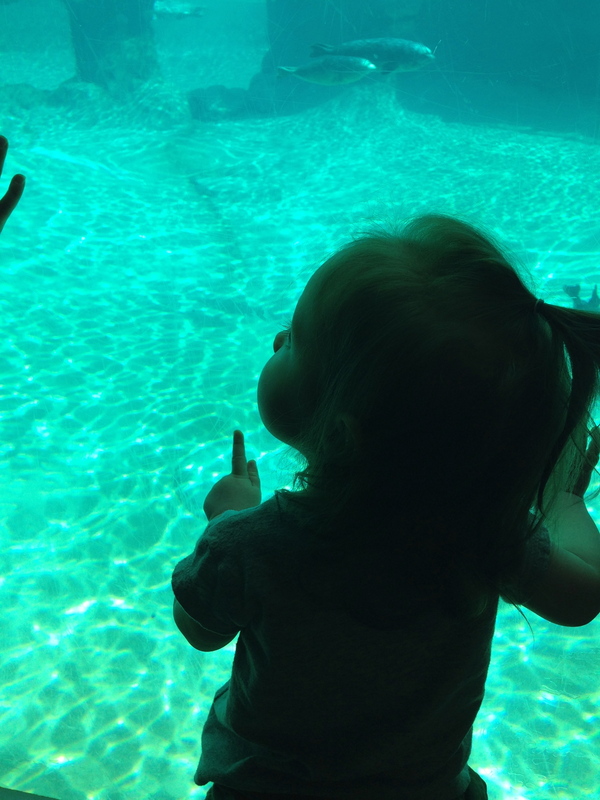 Until then…..here’s a pic of our beautiful daughter last week on her first trip to the zoo!